AlphaBetty Saga is another word puzzle game to grace the Android platform. 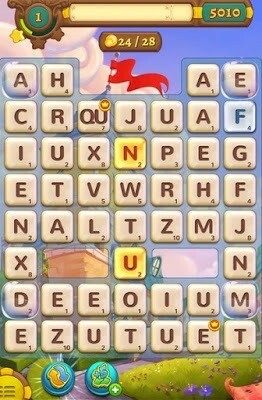 However, several gameplay elements bear no resemblance to popular games like Words on Tour or Ruzzle. The game offers new ways to use power-ups and has introduced a unique “crown” system that makes gameplay more engaging and fun. King is famous for its unique and addicting puzzle games. Its new game, called Diamond Diaries Saga, is now available on Android. Read this guide to find out how to complete levels and make the most out of power-ups. 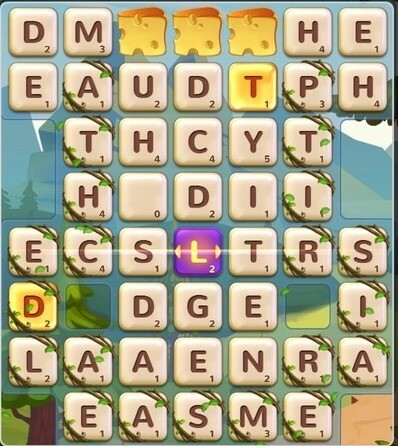 A crown appears on a random tile soon after creating a 4-letter word. A crowned tile can be very useful in removing a random tile below cheese chunks or can be used to pop bubbles. Make as many 4-letter words as possible to create crowned tiles. Next, try to create 4-letter words using those tiles. Doing this will not only remove a random tile below a cheese or pop a bubble, but also create another crowned tile. Repeat the same procedure to create extra crowned tiles. This way you won’t fall short of these special tiles. You may create a 3-letter word using a crowned tile, but it is recommended to create 4-letter word. Create 3-lettered words using a crowned tile when you can’t create a 4-letter word or when there are two crowned tiles placed side-by-side. Choose a set of adjacent letter tiles on the game board. You can choose a square block or rectangular block of letter tiles. See the above screenshot. Go to Scrabblewordmaker.net and enter those letters on the search box. You can enter a maximum of 15 letters and a “?” if there’s a blank tile. Press the Search button The word builder will return 3, 4, 5, 6, 7 and 8 letter words. Not all words can be created on the game board with the words returned by Scrabblewordmaker. However, you may find some words. 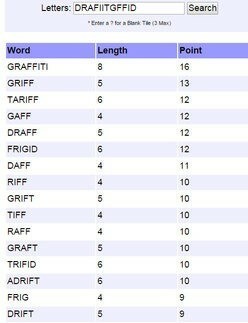 In this example, words like GAFF, DRAFF and RAFF can be created on the game board. An online word builder can be of immense help if you are clueless and can’t find any words on the game board. However bear in mind that only a few words can be created from the big list of word returned by it. When Should You Use the Shuffle Booster? The shuffle booster is probably the only free booster that can be used several times without paying real money or gold. However, you will need to create words to fill it up. Use the shuffle booster only when you can’t create longer words or there are too many X, Z, or QU tiles close to each other. The shuffle booster will reshuffle the game board; although that does not guarantee that you will have a more word creation-friendly game board. Tap on the shuffle booster when it starts to glow. Do not, I repeat do not tap on this booster when a small number appears on it. The number appearing on the booster is actually the number of times you can use it without filling it up. The longer the word, the more powerful a line blaster will be. The minimum number of tiles to create a line blaster tile is 5. A line blaster tile’s color changes to purple. Before using one, look at the arrows on a line blaster tile. Arrows on the left and right indicate a horizontal line blast whereas arrows on the top and bottom indicate a vertical line blast. Use a line blaster only when you feel that maximum titles can be removed with it. In later levels, you can use line blaster boosters. These boosters will not only let you choose a letter tile to place line blasters, but also the direction of the blast (vertical, horizontal or diagonal). You can use up to 3 line blast boosters for free and then need to spend gold for any additional booster. Save the free 50 gold for harder levels. Gold can be used on moves, lives and boosters. I would recommend using free gold on boosters or moves, but only when you can’t solve a harder level event after multiple tries. Look for plural forms of words and suffixes like “-ed”. This way, you will get rid of an extra letter from the game board. Finding plural forms of verbs will be easier than finding suffixes. Take advantage of blank tiles and create longer words using them. Take your time. Don’t be in a hurry. The same 3-letter word that you just created could have been made into something longer by adding more adjacent letters to it. Your first priority should be to search for 5-letter words. If you can’t find any, look for 4-letter words and finally 3-letter words. Didn’t earn 3 stars in the previous level? Well, you can go back and replay levels to earn more stars. However, bear in mind that if you fail to solve a level, you will lose a heart. Play Alpha Betty on Samsung A5. Never had problems before but in reaching level 783, when using reverse button to get out game, nothing happens because there is a lock appearing over Line Blaster. How do I get rid of lock sign pop-up? Can’t solve alphabetty find the letter 339 as turn is lost as soon as one starts playing. What is the strategy for this level? Think I’ve reached the end of the game as this seems impossible. Can’t solve alphabetty find the letters 333, as turn is lost as soon as one starts playing. What is the strategy for this level? Think I’ve reached the end of the game as this seems impossible. how do you pop empty bubbles? Not blank tiles, empty bubbles? I can’t get rid of the blank bubbles on level 80. I’ve tried every trick i know but i’m at a loss.